Ginger is a common flavour in lots of cakes and biscuits, but the way it gets there is usually through the use of dried and ground ginger. Fresh ginger is more normally used as one of the first things in the pan at the bottom of an Asian or Chinese dish. In its dried form, the flavour is concentrated and intensified, but dulled slightly. It warms rather than stings. It’s a similar but subtly different taste. This cake turns the tables completely over, using fresh ginger for its punch and bullishness. The quantity of ginger might seem alarming when compared to how much dried ginger you’d use in a gingerbread recipe, for example, but remember that dried ginger is a concentrated form – a ratio of six to one, fresh to dried is appropriate for substitution, so the mighty oracle of Wikipedia tells me. Even with this seemingly vast quantity of fresh ginger, the taste isn’t overpowering. The first thing to do is get prepared. Thoroughly grease a 23cm cake tin with butter and line the base with greaseproof paper. This part is slightly embarrassing, but I persevered for years trying to cut perfect circles out by folding greasproof paper into a cone, estimating the radius of the tin and snipping and trimming the end so that when the paper was unrolled, I had a rough circle that never quite fit. A while ago, one of the kids saw me doing this and said “Dad, why don’t you just draw round the bottom of the tin, like we do at school?”. So much easier to use a sharp knife just to score round the base on a chopping board for a perfect liner. Peel a 115g chunk of fresh ginger by scraping the skin away with the edge of a spoon and slice it thinly. Put the slices in a food processor and blitz until they’re finely chopped. They shouldn’t be mush, but they should be fine. The next part threw me a little, and I thought the whole lot was going in the bin, but it came through in the end … the cake has two types of sweetener – normal sugar, 200g of, and golden syrup, 250g. Put them together in a big bowl and add 250ml of vegetable oil, mixing together. I say ‘mixing together’, but the reality is that these ingredients will take a distinct aversion to each other. I was left with an amalgamated mass of sugars swimming in a sea of oil. No mount of beating would cause them to join together. A little heat helped to melt the sugar and bring it together, but it split apart once it started to cool. I decided to plough on, figuring that it must change dramatically later on, which, thankfully, it did. The trick here is some boiling water. Bring 250ml of water to the boil in a small pan and add two teaspoons of bicarbonate of soda. When the water is boiling, quickly whisk it into the oil and sugar mix. The blast of heat shocks the warring factions into co-operating. Keep the liquid on the move and gradually sift over 350g of plain flour, half a teaspoon of ground cloves, a teaspoon of ground cinnamon, and half a teaspoon of ground black pepper, mixing until everything looks like a cake batter. Break two eggs into the mix and work them in. Pour the batter into the cake tin and bake for an hour at 180c. Check every twenty minutes or so, and cover with foil towards the end to stop the top of the cake darkening too much. Let the cake cool in the tin before turning it out and serving. The result is a moist and spicy cake dotted with little hits of fresh ginger. It’s very autumnal. This looks incredible. 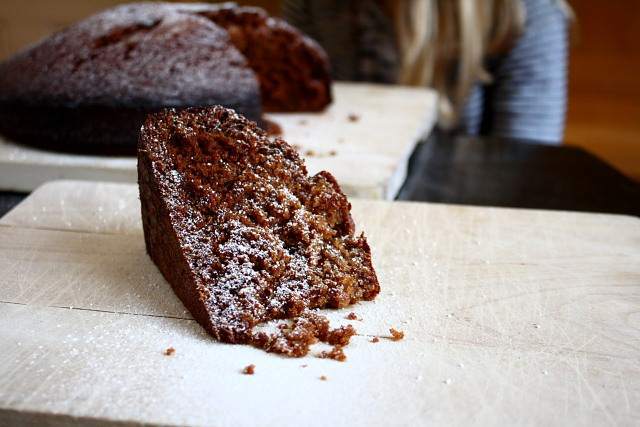 I’ve been put off ginger cakes in the last few years due to the all too common serving of a slightly dry, sandy-crumbed, annoyingly sticky (rather than luxuriously, decadently sticky) offerings I have had way too much of. But this, this looks so happily moist and sounds so gingery I might, possibly, have to make it for dessert tonight. What a beautiful pud! Corrrr! Looks lovely. I use fresh ginger too. keeps it really fresh and tangy with some treacle to make it even richer. Love your site!